The Asian River Restoration Network was established in Nov. 2006 to support the exchange of information relating to environmental restoration of rivers and watersheds. JRRN has a role of ARRN secretariat for first 2-year. The "River Restoration in Asian Monsoon Region" session on 4th World Water Form was cosponsored by three countries of China, Korea and Japan in Mar. 2006. In the session, panel discussion was held between the representatives of Malaysia and UNESCI-IHE additionally to that of three countries. At the end of the discussion, the necessity of cooperating network, data base of the river restoration and river restoration technical guideline suits for an Asian monsoon region was proposed. (1) It has been realized that river restoration is of vital importance to socio-economic sustainable development in parallel with flood management and water use management. (2) It is necessary to recognize that the basin as a basic unit for management, that the river environment is dynamic, and that the environment of the various rivers is maintained by dynamic disturbance. (3) It is necessary for the countries in Asian monsoon region to establish the suitable methodology and technology for river restoration, considering dense population, frequent and severe flooding, and abundant rice paddy. (4) In Asian monsoon region human-influence to a cultural landscape is harmonized with the ecosystem traditionally. Those landscapes that have been modified by humans over long periods are often also important for nature as well as culture. (5) It is important to develop a database and Asian network of projects and knowledge of international experts in river restoration. River restoration is a multi-disciplinary and multi-organizational task that should be supported by river engineers, environmental scientists, ecologists, water managers and the public. (6) It is urgent to establish a river restoration guideline suitable for the Asian monsoon region as a reference for countries with similar social and natural conditions. 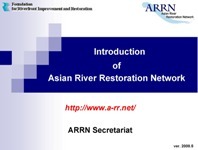 Taking these suggestion, Asian River Restoration Network (ARRN) was established in November 2006 with relative organizations in China, Korea and Japan. ARRN is a non political network for exchanging knowledge and technological information on the restoration of rivers and watersheds in Asia. One of the objectives is to provide various opportunities and venues for river restoration related organizations and individuals to share and exchange knowledge and experiences related to the restoration of rivers and watersheds through the network. ARRN aims to enrich the participants' knowledge and scientific technology through mutual and multilateral cooperation, and ARRN also contributes to creation of rich river environment in Asia. ARRN provides relevant information through website and newsletter as well as on the occasions of international forum, technical workshop and academic conference to exchange knowledge and technical information on river restoration. ARRN also aims to provide opportunities for groups and individuals to share and exchange their knowledge and experiences in the field, which would enable the participants to improve their knowledge and techniques through interaction. The management structure of ARRN is as followes. ARRN is organized with cooperation of domestic networks in each participating countries / regions, and so called as the management secretariat on a domestic network in those countries / regions to be "River Restoration Network (hereafter, RRN) " generically. As for a domestic network, a free activity in home countries or in local region is encouraged. The operating policy of ARRN is decided by "Governing Council" that consists by the representative of the Council in each RRN organization. The Council is summarized by the chairman approved in the Council, and resolves the activity plan and the budget planning, etc. of the year. The Council is administrated by the "management secretariat" resolved to the management conference. The management secretariat accomplishes the management conference and various ARRN activities. General participants are individuals or groups, who or which participate in event such as forums and uses profit of Web site. General participants need to register participation according to the rule that domestic RRN organization provides and assumes the generic name of the person who declares participation in ARRN. ARRN newsletter is delivered once in three months. If you want to receive the newsletter, please contact to secre@a-rr.net by email. ARRN news mail is delivered irregularly so far, and it will be delivered once a month. If you want to receive the news mail, please contact to secre@a-rr.net by email. Major activities of ARRN are introduced in "ARRN Annual Report".In the report, the various ARRN activities are arranged with photographs as well as ARRN outline.